Bengaluru, 19 December 2018 – Shangri-La Hotel, Bengaluru presents a festive Christmas Eve Dinner and Christmas Brunch as the most exciting year-end activities are around the corner, allowing people to spend time with their loved ones as a well-earned reward for a busy year. 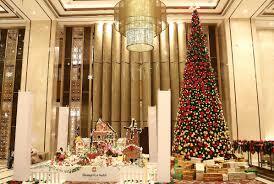 Guests can ring in the joys of Christmas and relish time-honoured celebrations at the hotel. All-day-dining b Café captures the enchantment of the festive season perfectly over a family-style meal. The restaurant will be wrapped in Christmas regalia as it presents a specially curated Christmas Eve Dinner and Christmas Brunch comprising delicacies from a truly festive spread to satiate the appetite. The exquisite buffet menu offers a plethora of choices featuring traditional favourites, such as an Arabic Mezze bar, Polenta Cakes with Mushroom Ragout, Whole Roasted Turkey, live grill stations and much more. Guests can indulge in a leisurely culinary feast while sipping on soft beverages or premium spirits in this yuletide paradise.